Rob Fryer learned to swim in the River Cherwell while at school in Oxford. He moved to Warminster in 1965, and soon started swimming at the Farleigh & District Swimming Club in the River Frome near Trowbridge. A busy family life with five children followed, and soon he was introducing them to rivers too. He became chair of Farleigh, in the dark days when wild swimmers were commonly regarded as lifestyle heretics. Then Roger Deakin visited and in 1999 he published Waterlog, which began to turn the tables on the Healthy & Safety zealots. Rob realised there was a need for a directory of swimming locations and soon began his thirteen year (still ongoing) search, of which this is the result. He ran a printing business in Warminster for 44 years and is currently a Town Councillor in Warminster. Then in 2003, together with Yacov Lev he founded RALSA, the River & Lake Swimming Association, in order to campaign on behalf of wild swimmers. With contacts from both Farleigh & RALSA, Rob found himself in an ideal position to pick up leads to watering holes. When out of the water, Rob spends much of his time campaigning on behalf of wild swimmers. He enjoys meeting fellow swimmers on the river bank, hence his interest in popular venues. In 2012 Rob went to Languedoc, Wales, Suffolk and the Thames to find even more swims. "Every year I find a gem or two" he says. In time these will be added to his publication: Wild Swimming Guide. Rob is a summer swimmer, so you will not see him breaking the the ice unless he is skating, which he considers the best UK winter sport, certainly in cold winters. (Yes, there still is wild skating in Wiltshire, but not every year.) He prefers traditional swimming sites and looks for ones that are used today or were used in the past. He shuns competitive swimming as he is certainly not good enough! He considers the beauty of a site, as well as the swim. PUBLIC SPEAKING. Considering that Rob learned to swim in a river (the Cherwell) and he has spent the last 13 years researching for new wild swimming venues, not to mention talking to visitiing swimmers at the Farleigh & District Swimming Club he rightly claims to know more wild swims than any other soul on earth. He has appeared frequently on radio and both national and international tv. Recently he was a speaker at the 2012 Buxton Adventure Festival in October and is now available as a speaker on Wild swimming, a British Phenomenon for events both large or small. He is chair of the Farleigh & District Swimming Club (the only river swimming club in the world) and the River & Lake Swimming Association, besides Mayor of Warminster. However he is a rebel at heart and presents a lively interactive show. Don't expect a monpolistic book plug. 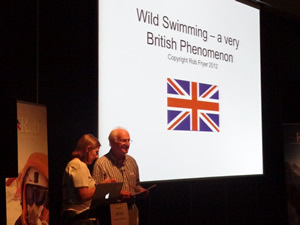 Rob insists on mentioning competitor books, as he is more interested in the overall recognition of wild swimming. He can also talk on Wild Skating and its History. Ring M:07733 1912395. T:01985 847168. Rob's partner, Sue Burrow, is a textile artist. She gives illustrated talks on her Textile Art. Another interest of Rob's is "wild skating", which he considers even better than wild swimming. He skated every weekend for 11 weeks during the big freeze in 1963. Since then he usually manages a skate every 2 or 3 years. He ran a colour printers for 44 years. His eldest son is a founder member of the Warminster Adventure Sports Club. Why is wild swimming so called? The term Wild Swimming was coined by Roger Deakin to refer to swimming in rivers and lakes, because it was considered beyond the pale by health & safety zealots. Today some people use it to refer to swimming in the sea, although the said zealots never attempted to ban seaside swimming (most likely because of the commercial interests involved). Abroad there are many who wonder what it means. Isn't it just swimming. they say. Well yes it is. However the word wild has tended to focus peoples minds on ever more remote and ever wilder locations. Outdoor swimming refers to rivers, lakes and the sea. Open water swimming is similar but generally infers use by competitive swimming.